The design and fitout of buildings must focus on the safety of people. Securing escape routes is especially important. Special solutions for exit doors must enable fast escape in an emergency. To this end, the emergency exists should be able to be opened without large effort by means of a handle and without the user having previous knowledge of how to operate the panic exit device. HEWI panic bars can be operated intuitively with minimum effort and therefore fulfil the requirements of EN 1125 for panic exit devices. To fulfil the requirements of EN 1125, the panic bar may only be used with jointly tested and certified locks. HEWI panic bars are approved with numerous lock manufacturers (Assa Abloy, BMH, Fuhr, GEZE, Grundmann, KFV, MSL, DOM and Wilka). Combination with BKS locks is a recent additional option. A person's sight deteriorates with increasing age and therefore constitutes an impediment for broad sections of the population. For people who see poorly to find their way around buildings, information must be presented in a highly contrasting way and in line with the so-called two senses principle (DIN 18040). At least two senses (seeing, hearing or feeling) should be addressed simultaneously. In this way the lacking or limited perception can be compensated for by another sense. Operation of the panic bar is communicated via two senses: The double gripping area made of coloured polyamide visualises the handling and is also detectable tactilely. The door opens if pressure is applied to the horizontal actuating bar. Due to the identification of the optimum pressure point according to the two senses principle the panic bar fulfils the requirements of DIN 18040 for accessible building. The minimised mechanism with the narrow gear unit enables the particularly slender design of the panic bar. Collision of the door frame and panic bar is excluded due to the narrow gear unit and the positioning of the bar on the inside of the gear unit. This also guarantees freedom from jamming when used on double-leaf doors. 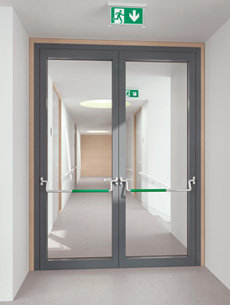 Precise-fitting installation is particularly easy due to the telescopic extendability (710 – 1580 mm) of the panic bar.